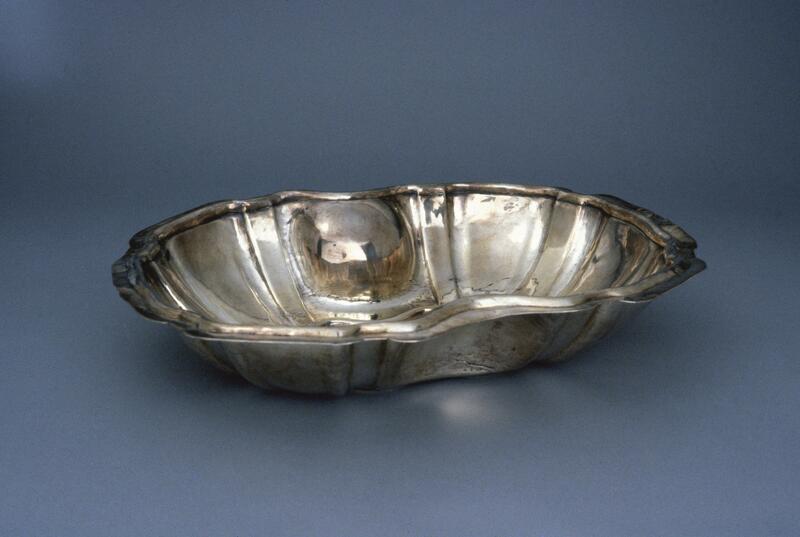 This basin may have once been paired with a ewer, a water pitcher, and used for washing or shaving. The curve on the side also suggests the basin could have been pressed against the arm to catch blood during bloodletting, a common medical remedy in the colonial period. Some ex-votos—small paintings often representing divine interventions in human lives at moments of crisis—show similar basins used in bloodletting. The rounded indents at bottom, while adding to the work’s visual interest, would also allow the filled bowl to be carried easily. 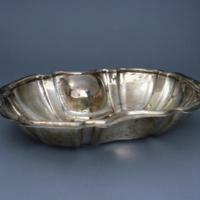 Silver is a durable material, but it also requires frequent polishing to keep its brilliant luster. Urban elites had easy access to inexpensive household labor who maintained objects like this one. The piece carries no maker’s stamp, typical for works made in the Viceroyalty of Perú. It measures ca. 39 x 29 cm. Fajardo Ortiz, Guillermo. 1996. Los caminos de la medicina colonial en Iberoamérica y las Filipinas. Mexico City: Universidad Nacional Autónoma de México, Coordinación de Humanidades, Facultad de Medicina. Lanning, John T. 1985. The Royal Protomedicato: The Regulation of the Medical Professions in the Spanish Empire. J. J. TePaske, ed. Durham, NC: Duke University Press. Rishel, J. J. with S. Stratton-Pruitt, eds. 2006. The Arts in Latin America, 1492-1820. Philadelphia: Philadelphia Museum of Art, and New Haven and London: Yale University Press.